In spring 2018, Taxify company and Robotex International 2018 launched the first self-driving fleet optimization challenge. On December 2, the AIC team, a joint team of students and researchers of Czech Technical University in Prague and Delft University of Technology celebrated the victory. During the competition (rules can be seen here), the participating teams were challenged to design a dispatching algorithm for a simulated self-driving car fleet in the Estonian capital Tallinn. A successful algorithm had to collect maximum ride value while respecting various constraints that simulate real operational conditions. The winning team that came up with the best solution received an award of 4000€. Taxify’s mission is to make transport affordable and accessible to everyone. Therefore, the goal is to have a car available within a couple of minutes for anyone in any location. It’s a goal in cities where Taxify is operating in today, but self-driving fleets that complement human drivers will be the next big leap. Taxify was asking the contestants to imagine a city in 2022. Self-driving car fleets will have become a reality even though drivers will still be playing a major role in the industry. The automated cars will be moving between passengers and depots where they can recharge. The contestants were programming the algorithms to dispatch the fleet of cars efficiently. “Taxify is building the future of urban transport and technology is crucial for making traffic in future cities more efficient. To solve the problems cities are facing, we need to encourage innovative thinkers and draw the attention of the global machine learning community to the interesting engineering challenges around urban mobility. This is why we’re happy to support events like Robotex Challenge and congratulate the joint team of Czech Technical University and Delft University of Technology on their well-deserved win,” said André Karpištšenko, Taxify’s Head of Data Science. Artificial Intelligence Center (AIC) from the Czech Republic and Autonomous Multi-Robots Lab (AMR) from the Netherlands both work on the analysis and optimization of transportation systems. “The participation in the competition gave us a chance to apply our expertise in artificial intelligence to a challenging real-world problem,” says Martin Schaefer, a researcher from AIC. 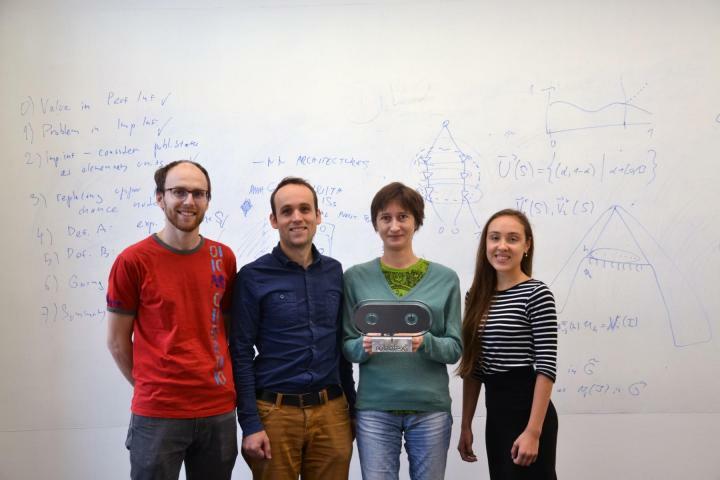 “The challenge was really complex, we needed to work with various sources of data, the given demand data had to be combined with the road network data extracted from the maps, and finally, we had to deal with several computationally hard problems,” says Olga Kholkovskaia, a computer science student at CTU in Prague. Today, more than 500,000 drivers use Taxify’s platform to offer rides to passengers. The competition painted a picture of a combined fleet of self-driving cars as well as human drivers. On-demand is on a fast rise to enable more people to use ride-sharing as a means for transportation. Today, on-demand rides make up 3% of all the rides in a city. Taxify estimates that by 2025, the share of on-demand trips will have increased to a third of the total. Additionally, we’ll be seeing different types of autonomous vehicles – some geared towards families, others playing the role of mobile offices or entertainment centres. One of the challenges in the competition was to optimize the time spent between driving passengers and waiting for the next ride. It required the participants to develop various dispatching, routing, rebalancing, depot planning, and pooling algorithms. The future will reveal if the algorithms and ideas of today’s winners will once control the real self-driving fleets in our cities.